A simple liquid chromatographic procedure for the separation and detection of magnesium and calcium in saline samples has been developed. 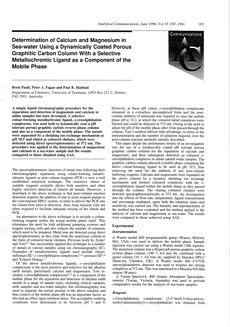 A selective colour-forming metallochromic ligand, o-cresolphthalein complexone, was used both to dynamically coat a pH tolerant porous graphitic carbon reverse phase column and also as a component of the mobile phase. The metals were separated by a chelating ion exchange mechanism at pH 10.5 and eluted as coloured chelates, which were detected using direct spectrophotometry at 572 nm. The procedure was applied to the determination of magnesium and calcium in a sea-water sample and the results compared to those obtained using AAS.